The government just approved the electoral law after more than 2 years of talks and speculations. The parliament still needs to give the green light so the drafted electoral legislature takes effect. But for a number of reasons, that Law is clearly shaped in a way that empowers M8 and the ruling coalition. PR in itself. Proportional representation is in itself a winning strategy for Hezbollah and Michel Aoun. Just take a look at the diagrams related to the 2009 elections. Denying the right to vote on expatriates. The Lebanese abroad cannot vote according to the current Law. They are known to be reluctant to Hezbollah and M8, especially for the ones that are in the Americas. Silencing them in this way seems very efficient strategy to avoid any kind of bad surprises. “A better Law”. M8 introduced the women’s quota, PR and lots of other innovations. They are counting on the support of activists for the law to pass, or at least to make M14 to look undemocratic in their efforts to turn the drafted law down. The Constituencies’ Decoupage. In PR, the constituencies sizes hardly influences the result, because of the nature of proportionality per se. But having a sizable Shia community in a predominantly Christian constituency per example, might change the result by 1 or 2 MPs in each district. The 2 Constituencies Of Beirut. Unlike 2009 when there were three constituencies, Beirut is divided to two constituencies, a predominantly eastern Christian one (With 7 Christian MPs, a Shia and a Sunni) and a predominantly Muslim (Sunni) western one (With 5 Sunni MPs, a Shia, a Druze and 3 Christians). Usually, under the previous law, Aoun and M8 could only compete in Beirut’s first constituency (Ashrafieh, Rmeil Saifi), which includes 5 MPs, under a Majority Law which made things very hard for M8. Now, the Christian constituency is bigger, seperated from the Sunni one, and is under a PR law. Aoun can easily get 4 out of 9 MPs in the eastern constituency, and M8 has a realistic chance of being represented in the western constituency, with at least one or two out of the 10 MPs. A minimum of 6 MPs for M8, in Beirut where they currently have 2. The Sunni vote’s influence on 7 Christian MPs is being cut in the eastern District, while the battle’s result in the western district is no longer a foregone conclusion because of PR. The 3 Constituencies Of Mount-Lebanon. The constituencies’ shapes follow a certain pattern. The 2 districts that are to a great extent purely Christian, the ones of Kesrouan and Metn are each merged with another district that has a certain number of shia in it. The former is merged with the distict of Byblos which has a salient number of Shias. Although according to PR, the results won’t matter a lot, but it should be noted that it can influence the results by an MP in Kesrouan, hence giving Aoun the upper hand in this constituency. The latter district of Metn will be merged with the district of Baabda. Baabda is 50% Christian, 30% Shia and 20% Druze. The 10% Shia lead of the Shias over the Druze in the district influenced the results of the 2009 elections in Baabda and will sure have an influence (although not very important because the winner doesn’t take it all in a PR electoral system) on the Baabda-Metn results, helping Aoun to get 1 More MP in the Metn. ironically, it is not the constituencies of Baabda-Metn and Kesrouan-Jbeil where the electoral battles are that are usually enthusiastic that are noteworthy, but rather the constituency of Chouf-Aley. In lots of previous electoral laws, the districts of Aley and Baabda formed on single constituency. The 10% Shia lead over the Druze in Baabda that I spoke of before was highly masked by the Druze which form more than 50% of the voters in the district of Aley. When Baabda was separated from Aley on the eve of the 2009 elections, M8’s win in the district was possible due to the independence from the high number of M14 Votes in Aley. In 2013, not only was Baabda separated from a predominantly Druze zone, but it was also merged with the Metn where its Shia can influence the battle over there. And merging the Chouf with Aley isn’t innocent at all. In a PR system, the higher the number of MPs, the bigger the district, the better representation you get. M8 merged the two districts in a subtle way to get one more MP than it can get. A simple demonstration will do it. Let’s suppose Aoun gets 45% of the votes in Aley (and thus 2 out of 5 MPs, 40% of seats) and 30% in the Chouf (2 out 8 seats, 25% of seats). If the two districts were merge, he will have 37% of the votes and easily get 4 seats while if the 2 districts were separated he would have gotten 3. Of course, Aoun should score above the average of the MP/voter or else he will get less than 3, but it is worth it to risk that battle if it means weakening Jumblatt in his headquarters. The 2 Constituencies Of The South. Jezzine, the only southern district where the Christian are majoritarian, and Saida, the only city where the Sunni votes prevails, were merged with the districts of Tyre and Zahrani hence their myriad of Shias. One would say that it wouldn’t matter in a PR electoral system, until he realises that there is usually 1 Christian MP for every 20000 Christian while there is 1 Muslim MP for every 30000 Muslim. there will be about a 10000 Muslim voter overflow on each Christian MP. In other words, because of PR, it is very likely that the Shias voters will indirectly pick a Christian MP of Jezzine and another Sunni one from Saida. Another constituency, the one that happens to be the Governorate of Nabatiyeh, id formed by the districts of Hasbaya, Marjeyoun, Nabatiyeh and Bint Jbeil. It should be noted that if Hasbaya was separated from Marjeyoun in 2009, M14 would have won in that district. So to vilify the outcome of the district in a PR system, it was merged with 3 bigger districts where it is mainstream to be M8. 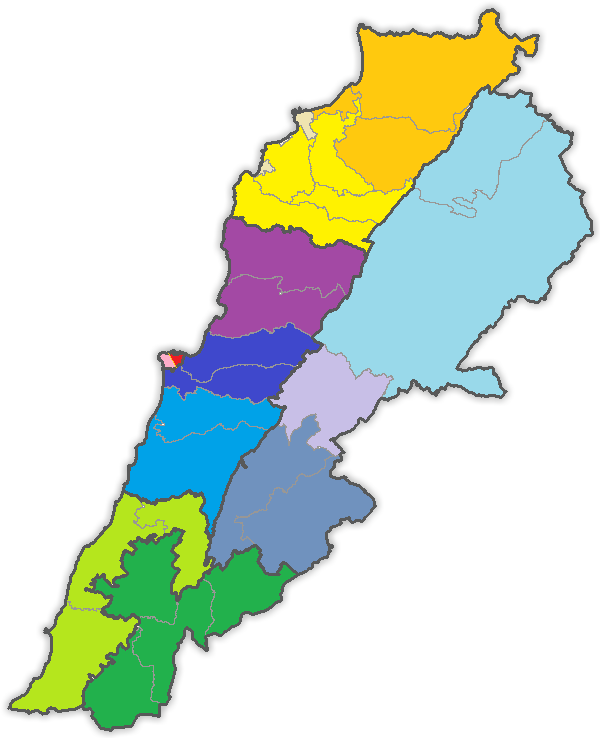 The 3 Constituencies Of The Bekaa. The boundaries of the constituencies weren’t changed from the last elections albeit PR will help Aoun get 2 of 6 MPs in West-Bekaa-Rachaya, 3 out of 7 in Zahle, while M8 will hardly get more than 3 MPs out of 10 in Baalback. M8 will gain 5 and lose 3 seats, a total of 2 more seats in the Bekaa because of PR in these districts. The 3 Constituencies Of The North. And this is the best part. The 4 Christian districts of Koura, Bcharre, Zghorta and Batroun were separated from the other districts and united in a single constituency. And this move is full of meanings. The Sunni influence, slightly present in some districts such as Koura and Batroun, is even more diminished by uniting the district together, while separating the city of Tripoli from these constituencies should destroy any attempt of external Sunni interference in that constituency. separating Tripoli from Akkar adn Minieh-Denieh is also full of explanations. Mikati’s influence is concentrated in the city so is the influence of his allies: Safadi, Karami, and the Alawi minority in the city. separating the city from the other Sunni region is an attempt by M8 to fight a winning battle in the city. While merging Akkar with Denieh and Menieh seems similar to the union of Aley and Chouf: The more you merge, the more you can hope to get more MPs. From the concept of PR to the redesigning of the constituencies, it seems that the Government shaped a Law that gives M8 The supremacy in next year’s elections. You can take a look here to see how the seats will be distributed if that law was 2009’s one. Jumblatt is against the Law, so are the phalanges the LF and FM. But everyone has a price. M8 has 61 MPs in the parliament. It still needs the support of 4 other MPs to pass the Law. Making some extra touches on the Law like merging Hasbaya and Rachaya into a single constituency and creating another Jumblati Hub might be enough to convince Jumblatt. The Phalanges and LF that can run without Future Movement’s umbrella and still get a higher number of seats under such a law can also easily be convinced. But you definitely don’t want Jumblatt to use his weapon: withdraw from the government, make it collapse and paralyse the parliament right before the voting session until a compromise is reached. That awkward moment when you realise that Kamal Jumblatt worked all his life and put all his effort for the adoption of a PR electoral Law, while his son seems to be doing the exact opposite. Posted in Lebanese Politics, Parliamentary Elections, Politics on August 9, 2012 by Ramez Dagher.